John the Baptist is a fundamental key to understanding the end of the end of the 70 Weeks of Daniel 9! In confirmation of the previous article, take a quick look at another key text that fully supports the idea that the taking away of Israel’s sin- which was confined to the seventy weeks of Daniel 9 – was to be at the Day of the Lord in judgment. Be sure to read the first installment as well. Our focus is on the ministry of John the Baptist as we investigate his critical– yet often overlooked- role in understanding Daniel 9. In this, one of the most famous and challenging of all of Paul’s discussions, the apostle patently anticipated the salvation of Israel, the taking away of her sin. Just as Isaiah 40 and Daniel 9 foretold the time of the taking away of Israel’s sin at the Day of the Lord and the full arrival of the kingdom and the judgment, Paul anticipated the salvation of Israel, the taking away of her sin at the coming of the Lord. While commentators seek – sometimes desperately – to avoid the eschatological nature of Romans 11 it cannot be denied. Paul is not speaking of Jesus’ incarnation or even the cross, per se. This is not, by any means, to deny, to exclude, or to depreciate the indisputable fact that the cross was the means by which that salvation would be purchased. It is simply to acknowledge what Paul – and Isaiah and Daniel – says: Israel’s salvation would fully arrive at the coming of the Lord. This assessment is confirmed by a quick examination of two of the prophecies that Paul quotes from directly in Romans 11, and that is Isaiah 27 and Isaiah 59. (For a fuller discussion of Paul’s citation of these two OT prophecies see my book on Elijah mentioned below). I will give here some bullet points from those two passages. Isaiah 26:20f – We have the coming of the Lord for the avenging of the martyrs. Isaiah 27:1-2 – The destruction of Leviathan (Satan) in the day of salvation. Isaiah 27:10 – The taking away of the sin of Israel. This is the text that Paul quotes in Romans 11. Isaiah 27:11f tells us that all of this would take place when the Lord would no longer have mercy on the people He had created, when the fortified city and the Temple were destroyed. It should be noted here that Isaiah directly cites the Song of Moses about Israel’s last days. In her last days, the people of no understanding would come to their last end (Deuteronomy 32:19f). In Isaiah 27 we have the identical constituent elements that would be given later in chapter 40. We have the salvation of Israel at the coming of the Lord in judgment to take away Israel’s sin. Since Isaiah 27 anticipated the taking away of Israel’s sin and since Daniel 9 foretold the taking away of Israel’s sin within the seventy weeks, this logically demands that unless one can prove definitively that Isaiah 27 & 40 and Daniel speak of different salvations of Israel, at different comings of the Lord, then Isaiah 27 would be fulfilled within the seventy weeks of Daniel 9. In a direct parallel with Isaiah 27, chapter 59 foretold the salvation of Israel at the coming of the Lord in judgment of Israel for shedding innocent blood (vs 3-7, 16f) in fulfillment of the Lord’s covenant with her: “This is my covenant with her, when I take away her sin.” (Other chapters in Isaiah e.g. Isaiah 52, 61-66, also speak of Israel’s salvation at the Day of the Lord but for brevity we cannot discuss those). Once again, at the risk of redundancy, unless one can prove definitively that Isaiah 59 and Daniel speak of different salvations of Israel, at different comings of the Lord, then Isaiah 59 would be fulfilled within the seventy weeks of Daniel 9. The implications for putting Romans 11 within the proper framework and context should be apparent by now. Romans 11:25-27 foretold the coming of the Lord to take away the sin of Israel. Romans 11 would be in fulfillment of Isaiah 27 / 40 / 59. The taking away of Israel’s sin of Isaiah 27 / 40 / 59 is the taking away of Israel’s sin foretold in Daniel 9:24. The taking away of Israel’s sin foretold in Daniel 9 was confined to the seventy weeks. Therefore, the taking away of Israel’s sin at the coming of the Lord foretold in Romans 11:25-27 was confined to the seventy weeks of Daniel 9. What we have in Isaiah 27, Isaiah 40, Isaiah 59 are predictions of the salvation of Israel. That salvation is, in each of these texts, posited at the time of the judgment of Israel for shedding innocent blood. It is the time of the coming of the kingdom. Unless those prophecies of Israel’s salvation are totally different from Daniel 9, then, as we have observed they had to be fulfilled within the seventy week countdown. I suggest that these intra-textual and inter-textual connections allow us to make some definitive conclusions about the seventy week countdown, specifically, the time of the end of the seventy weeks. It is suggested among some partial preterists and full preterists that the seventy weeks ended in AD 34-35. But, if the salvation of Israel, i.e. the taking away of her sin, was to occur at the Day of the Lord in judgment, as Isaiah 27 / 40 / 59 clearly teaches, and if the taking away of her sin is confined to the seventy weeks, then to say that the seventy weeks ended in AD 34-35 is to say that the Day of the Lord occurred in AD 34-35. That is patently untenable. You cannot posit the taking away of Israel’s sin at a different time, in a different context from that established and demanded by Isaiah 27, 40 or 59. Each of those texts is very clear that the taking away of Israel’s sin was inseparably tied to the coming of the Lord in judgment for the avenging of the blood of the martyrs. Yet, that is precisely what is demanded by the suggestion that the seventieth week ended in AD 34-35. If the taking away of Israel’s sin at the establishment of the kingdom, at the coming of the Lord for the avenging of the blood of the martyrs and the judgment did not take place in AD 34-35, then the seventieth week of Daniel 9 did not end in AD 34-35. The taking away of Israel’s sin would be at the coming of the Lord in the judgment of Israel- Isaiah 27 / 40 / 59 / Romans 11. The taking away of Israel’s sin is confined to the seventy weeks of Daniel 9. Therefore, the taking away of Israel’s sin of Daniel 9- confined to the seventieth week– would take place at the coming of the Lord in judgment of Israel. This precludes any possibility that the seventieth week ended in AD 34-35. To suggest that the seventieth week ended in AD 34-35 divorces the taking away of Israel’s sin from the coming of the Lord. It posits the taking away of Israel’s sin prior to the very clear, unequivocal time of the taking away of Israel’s sin established by Isaiah 27 / 40 / 59. This is simply untenable. When Paul wrote Romans 11, AD 34-35 was two decades in the past, meaning, supposedly, that the seventieth week had ended. But, if the seventieth week had ended, then Israel’s sin had been removed: “Seventy weeks are determined… to put away sin.” That clearly violates Paul’s explicitly stated hope in Romans 11 that the taking away of Israel’s sin – at the coming of the Lord – had not yet taken place. So, if the coming of the Lord to take away Israel’s sin was still future to Paul – and it was – and if the taking away of Israel’s sin is confined to the seventy weeks – and it was – then since the taking away of Israel’s sin at the Day of the Lord in Romans 11 was still future to Paul, this logically demands that the end of the seventy weeks was still in Paul’s future when he wrote Romans in the mid to late AD 50s. ☛The salvation of Israel is confined to the seventy weeks. ☛The salvation of Israel would be at the coming of the Lord in judgment in vindication of the martyrs. ☛Therefore, the coming of the Lord in judgment belongs within the seventieth week. You simply cannot end the seventieth week before the coming of the Lord in the kingdom and in the judgment to put away Israel’s sin. That is gross anachronism. The taking away of Israel’s sin would be at the coming of the Lord in judgment of Israel for shedding innocent blood – Isaiah 27 / 40 / 59 / Daniel 9. The taking away of Israel’s sin would occur within the seventy weeks- Daniel 9:24. The seventy weeks ended in AD 34-35 – This is the view of, among others, partial preterist Gary DeMar, who says the seventieth week ended 3.5 years after the cross. (Gary DeMar, Last Days Madness, (Powder Springs, GA; American Vision, 1994), 232). Therefore, the Day of the Lord in judgment of Israel for shedding innocent blood, and to take away Israel’s sin, had to have occurred no later than AD 34-35. To say that this is untenable and un-biblical is an understatement. The indisputable fact is that all four of these texts, Isaiah 27 / 40 / 59 / Daniel 9, contain, either explicitly or implicitly, the prediction of the taking away of Israel’s sin at the coming of the Lord in judgment. They also contain the motif of martyr vindication – which of course, Jesus posited at the judgment of Jerusalem (Matthew 23). Since Daniel 9 posits the salvation of Israel (including martyr vindication) within the seventy weeks, it is untenable to say that the seventy weeks ended in AD 34-35, while the judgment of Israel at the coming of the Lord to take away her sin, came years after the end of the seventieth week. That is an overt violation of what these prophecies of Israel’s salvation predicted. 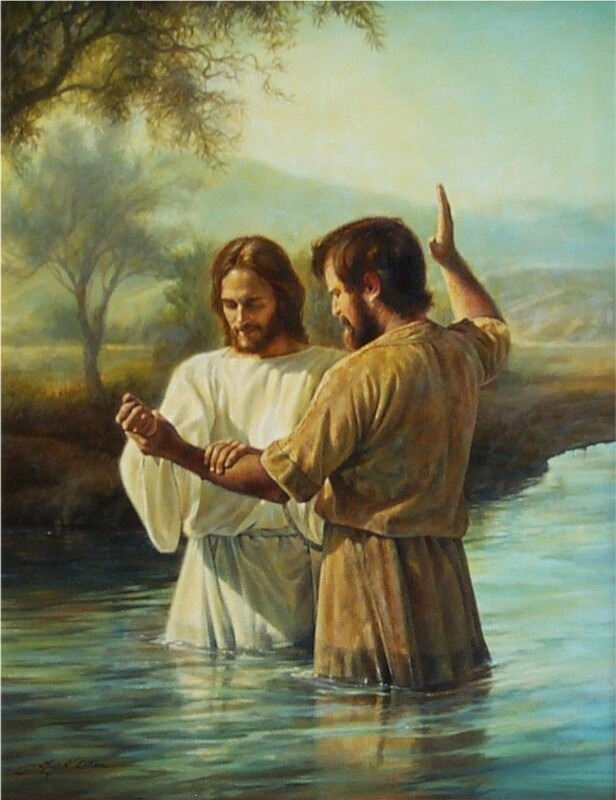 All of the connections above bring us full circle back to John the Baptizer as The Voice. Since John was The Voice to announce the Day of the Lord– the time when Israel’s sin would be taken away (Isaiah 40:1-2; Isaiah 27 and 59), and since the time when Israel’s sin would be taken away is Romans 11:25f– at the Day of the Lord – then John’s message and ministry should be determinative for placing Romans 11 in the proper context, and that was the imminent Day of the Lord at the judgment of Israel! Likewise, since John the Baptist was The Voice to announce the Day of the Lord– the time when Israel’s sin would be taken away (Isaiah 40:1-2- also Isaiah 27 and 59), and since the time when Israel’s sin would be taken away is confined to the seventy weeks, this means that the Day of the Lord to take away Israel’s sin, was not in AD 34-35. It means that the time of the judgment and the taking away of Israel’s sin did not and could not happen until the coming of the Lord in judgment- which was when the city and the temple was destroyed at the time of the end (Daniel 9:27). John’s repeated and urgent warning to Judah and Jerusalem that the time for her harvest was now upon them, that “the wrath” was about to come (the Day of Wrath of Malachi 3-4) and that the axe was already at the root, (directly echoing Malachi 4:1-3) serves as powerful and irrefutable proof that Daniel’s 70 weeks were to end in the judgment of Israel, her judgment for shedding innocent blood. That was in AD 70. All attempts to posit the end of the seventieth week of Daniel 9 before the coming of the Lord in the kingdom and the judgment short circuit the seventy week countdown. All efforts to have the end of the seventieth week prior to the coming of the Lord in judgment are in overt denial of Isaiah 27, Isaiah 40, Isaiah 59 and Romans 11:25-27. Any effort to posit the end of Daniel’s seventieth week in our future denies the context of Isaiah 27 / 40 / 59 / and Daniel 9. It also denies the role, the ministry and the message of John the Baptist as The Voice. His message – his very person – places the coming of the Lord, the judgment, the kingdom, the salvation of Israel in the first century. Any interpretation of Daniel 9 and the seventy weeks that ignores the ministry and the message of John the Baptist is guilty of ignoring a vital interpretive key for understanding Biblical eschatology. 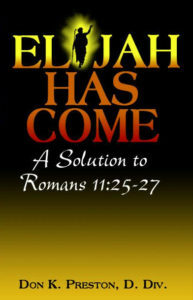 Be sure to get a copy of my book, Elijah Has Come: A Solution to Romans 11:25-27. This book has an excellent discussion of the critical eschatological role of John the Baptist.